With more people than ever riding bikes on Seattle streets, the city’s helmet laws have become practically non-existent. All cyclists have been required to wear a helmet in King County since 2003, though it’s increasingly unlikely you will be ticketed if you fail to follow the law. While some helmet laws in Washington State require only certain ages to wear a helmet – for example, the city of Poulsbo's helmet law only applies to those under the age of 18 – King County’s law applies to everyone on a bicycle. The penalty for not wearing a bicycle helmet is a civil infraction and carries a fine of $30. Additional court costs are tacked onto the ticket, bring the total cost to $81. It’s up to enforcement officers – police officers, state patrol troopers, etc. – to enforce these laws. And today more than ever, tickets for not wearing a helmet are not being written. According to research compiled by MyNorthwest, Seattle police are not issuing many citations to helmet-less cyclists. In 2011, 607 tickets were written for bike helmet violations in Seattle. Compare that to the 41 issued in 2016, a 93 percent decrease in just five years. Several cities in King County, however, are still writing bike helmet tickets, MyNorthwest found. Kent, with a population of 127,000 – compared to Seattle’s 700,000 – issued 29 tickets for bike helmet violations in 2016, a decrease from previous years, but still significant. As bike share companies become more popular, it’s likely that the helmet laws will continue to be unenforced. Even though unhelmeted bicyclists suffer injuries tallying approximately $2.3 billion each year according to the Centers for Disease Control, some pro-cycling people would like to see King County’s helmet law abolished altogether. A 2012 story in the New York Times found that helmet laws discourage people from riding a bicycle, an obstacle for growing ridership in the very cities that those laws are implemented. 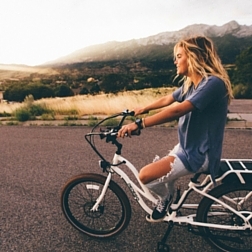 Bike shares can operate more freely when users are not required to wear helmets. Limebike has run a special helmet giveaway in the past. Pronto, which no longer operates in Seattle, provided helmets. Spin, as well as Limebike, remind riders to obey Seattle’s helmet laws when the ride starts. ofo, which chose Seattle as its first U.S. city, also simply reminds riders to wear a helmet – but does not provide one. Naturally, bicyclists who are involved in an accident are going to be at a greater risk of serious injury than someone in a motor vehicle – the laws of physics involved are pretty difficult to dispute. Wearing a helmet is always a safe practice. If you or someone you know has been involved in a bicycle accident, it is in your best interest to consult with an experienced attorney with a track record of representing bicycle accident victims. The bicycle accident attorneys at Davis Law Group, P.S., will review your case for free. Use the confidential contact form on this page or call (206) 727-4000. 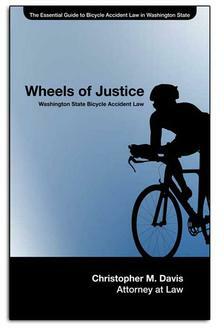 Get your complimentary copy of "Wheels Of Justice: Washington State Bicycle Accident Law" absolutely free by clicking the "Order Now" button below. Award-winning bicycle accident attorney Chris Davis has written a series of FREE books, including one about bicycle accident cases in Washington state. The books answer common legal questions that people and their loved ones may have about their legal rights, including how to handle your claim on your own and when you might need an attorney's help.